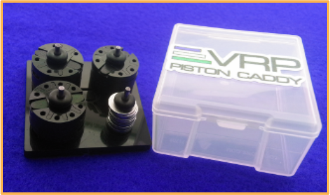 This is a set of (12) Patent-Pending VRP 'XV3' Pistons' - (4) 5 Hole 1.5mm, (4) 6 Hole 1.3mm, (2) 8 Hole 1.2mm, (2) - 8 Hole 1.2/1.3 Splits inside a Free Piston Caddy. These are the most popular sizes all in one kit. The pistons come complete with the Transition Valve pre-installed. The Rebound booster hole has been precision drilled to the exact size our testing found to be the best 'all around' setting. This yields excellent results that are proven on a variety of track surfaces. From rough, blown out tracks, to smooth, indoor clay, the VRP Piston makes a positive difference and gives you a Big Advantage over the competition!